At Santa Monica Fertility, we understand that seeking fertility treatment can be one of the most significant decisions a individual or a couple can face. You want someone to help you build your dream, with guidance, respect, pioneering technology and unparalleled personal care. 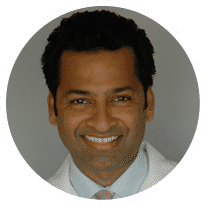 Check out Dr.Jain’s discussion on fertility & pregnancy over forty where he talks science & solutions for women who are pursuing later motherhood. We offer a comprehensive range of care, from basic testing to innovative IVF techniques, including egg donation, gender selection, gestational surrogacy, egg freezing, and tubal embryo transfer, and we believe in providing individualized reproductive medicine and infertility services for both women and men. Our expertise is reflected in the success rates at Santa Monica Fertility, which are comparable to the best programs in the United States. Fertility practices are encouraged to report their success rates to the Center for Disease Control. The results of such data-gathering are published online, and are made available approximately two years after the information has been gathered. Publication of live birth rates allows for comparisons between fertility clinics. Rates published by individual fertility centers should be considered carefully, as some centers set strict patient criteria in order to maintain seemingly superior live birth rates. At SMF, we view each patient as an individual and do not set arbitrary cut-offs. Rather, we feel each patient should be counseled on all possible options and then allowed to make the best decision for herself. We work frequently with women of advanced maternal age. Because fertility treatments impact our patients both physically and emotionally, we have established relationships with local wellness practitioners who offer mind/body programs, acupuncture, massage therapy, and other complementary therapies. These methods have been proven to both significantly reduce the symptoms associated with stress and anxiety and to increase the likelihood of conception.